The great earthquake of 1906 that leveled San Francisco also struck the Point Arena Light Station. The Keeper’s residence and Lighthouse were damaged so severely that they had to be demolished. 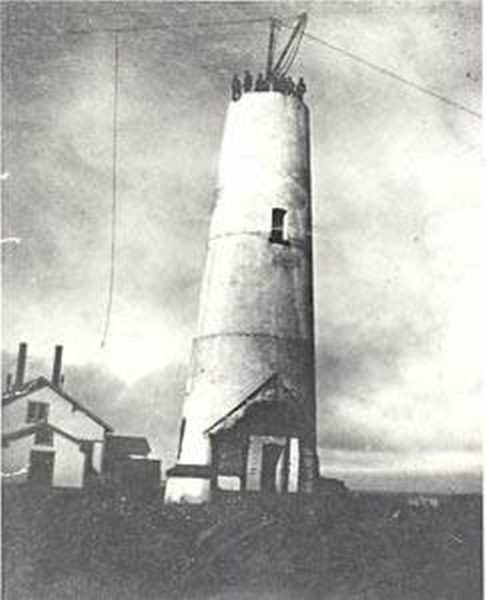 The United States Lighthouse Service contracted with a San Francisco based company to build a new lighthouse on the site, and specified that it had to be able to withstand any future earthquakes. The company chosen, normally built factory smokestacks, which accounts for the final design for the new Point Arena Lighthouse; featuring steel reinforcement rods encased in concrete. This was the first lighthouse built this way. The new Lighthouse began operation in 1908, nearly 18 months after the quake. It stands 115 feet (35 m) tall, and featured a 1st Order Fresnel lens, over six feet in diameter and weighing more than six tons. The lens was made up of 666 hand-ground glass prisms all focused toward three sets of double bullseyes. It was these bullseyes that gave the Point Arena Lighthouse its unique “light signature” of two flashes every six seconds. This incredible optic, that held an appraised value of over $3.5 million, was set in a solid brass framework, and was built in France. I have not, to date, seen pics of the Point Cabrillo under construction until I found this one. Click on it to see it full size and look carefully at the top – you can see the construction workers.